Vortex generators: just a fad or are they effective on road cars? This article was first published in 2006. So have plenty of race cars and some one-off specials. And you’ll also find them on aircraft wings. They’re vortex generators. So what are they, what can they do for your car’s aerodynamics and where can you get them? 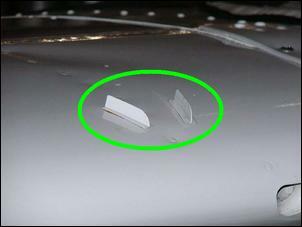 But before we take a look at vortex generators – which we’ll do next week - you need to know something about car aero. 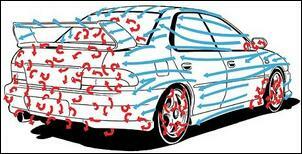 Airflow over a car’s surfaces can be divided into two simple types – laminar (attached) flow, and turbulent (separated) flow. Wool-tufting (where short lengths of wool are stuck all over the car to show what the air is doing) is an easy and effective method showing what type of flow is actually occurring as the car is driven along. One reason that the flow is so good on the front of the Porsche - even over these changes of shape - is that at the front of the car, the boundary layer is quite thin. So what’s the boundary layer then? The boundary layer is that thin blanket of air sitting on the surface of the body that is being dragged along with the car. It varies in depth, normally getting thicker towards the rear of the car. If you’re an ant sitting on the bonnet of the car, you’ll have to hold on bloody well because there is only a very thin layer of air that is travelling at the speed of the car. Stick your head up even a little and you’ll be in the full force of the moving air – you’ll be out of the blanket that’s the boundary layer. But your buddy ant at the back of the car will be having an easier ride. He can probably do gymnastics without being blown off because the layer of slower moving air is much thicker back there. The thicker the boundary layer, the more easily airflow will separate from the body, leading to turbulent flow. 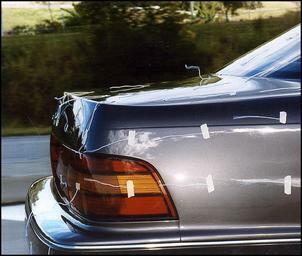 The Lexus LS400 shows that flow separation occurs down the middle of the rear window and partly onto the boot. However, the flow re-attaches itself on the boot lid. The fact that the flow does re-attach is significant because the overall size of the wake (the area of disturbed, turbulent air being dragged along behind the car) is much smaller than if the flow separated from (say) the trailing edge of the roof. This diagram, drawn on the basis of on-road wool tuft testing, shows that there’s plenty of flow separation on the rear parts of the Impreza WRX. In datail, note the attached flows across most of the leading panels, with turbulence confined to three distinct areas: the (aftermarket) wheels, behind the rear vision mirror, and just behind the front wheel. The flow across the C-pillars and trailing edge of the roof is attached, but it separates only a very short way down the rear window, creating a major area of turbulence across the rear window and boot lid. However, the tall wing is sufficiently out of this turbulence to be in clean air, as can be seen by the attached flow across the aerofoil. The wake behind the WRX can therefore be estimated as being the full width of the car, with its height a little greater than the upper edge of the boot lid. Aero Testing - Part 3. 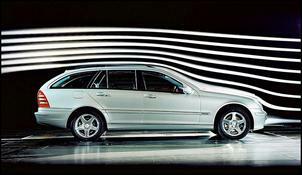 Flow separation is bad because it leads to a larger wake and less pressure on the rear surfaces (like sloping rear windows), reducing pressure recovery, ie reducing the pressure of the air that can help push the car forwards. To avoid flow separation, the changes of angle at the back of the car (eg in three-box sedans, the transitions from the roof to the rear window to the boot lid) need to be very gentle. Cars with a two-box shape (eg hatchbacks and wagons) are always stuck with flow separation at the end of the roof, so creating a larger wake. In those cars, and also at the trailing edge of the boot in three-box cars, the separation should be clean – ie the flow shouldn’t wrap around the end of the roof or the boot lid. 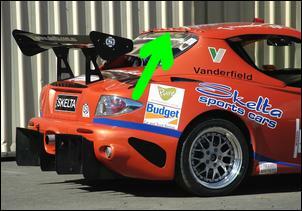 ... as do sedans by means of the sudden transition from horizontal to vertical at the trailing edges of the boot lid. So premature separation leads to a larger wake which in turn creates more drag. In addition, any aero devices – like wings – need to be working in ‘clean’ air (ie laminar flow) to work effectively. The further you get towards the back of the car, the harder it is to keep the flow sticking to the bodywork. Because of the increased thickness of the boundary layer, air more easily separates, resulting in a larger wake, less pressure recovery and poorer performance of rear mounted wings. So when the shape of the car is already fixed, can anything be done to reduce the thickness of the boundary layer or put more air into the wake? 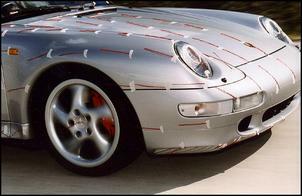 Interested in do-it-yourself car aerodynamics? 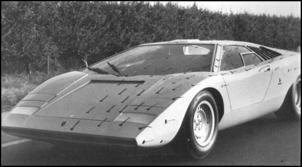 You’re sure then to be interested in the Amateur Car Aerodynamics Sourcebook, available now. From the weird to the weirder! Cheaper than a half-cut and lots more bits! Increase the output of small pumps, lights and fans!